"The Amazing Race" kicked off its 21st season Sunday with 11 new teams, and a new twist. As the teams prepared to begin the race around the world, host Phil Keoghan informed them that if the team that won this first leg of the race also finished first on the final leg, prize money would be doubled to $2 million. With the stakes that high, it's not surprising that some teams didn't want to help others. But one pair did - and it cost them that important first-place finish (Warning: Spoilers ahead!). The episode began with the 11 teams in Pasadena, Calif. To get their hands on the first clue, both members of each team had to rappel down a bridge and hop into cars. They were then informed that their first stop was Shanghai, China. But, only the first seven teams to make it to the airport would make the early flight out of Los Angeles. The second flight landed more than an hour later. The lucky seven teams to make that first flight were: Dating divorcees Abbie and Ryan, married monster truckers Dave and Kelley, on-and-off couple Amy (a double-amputee snowboarder) and Daniel, Chippendale performers James and Jaymes, twin sisters Natalie and Nadiya, friends James and Mark (who goes by "Abba") and best friends Caitlin and Brittany. The teams stuck on the second flight were: Goat farmers Josh and Brent, engaged couple Rob and Sheila, teachers Gary and Will and college sweethearts Trey and Lexi. Once they arrived in Shanghai, teams made their way to the Yuanshen sports center stadium, where they encountered their first road block. The clue card read: "Who wants to get paddled?" The task required one team member to score one point in table tennis against a 10-year-old Chinese junior champion, who played with household objects like a frying pan and clipboard to level the playing field. The next clue brought teams to Cui Ping Ja Ja restaurant and asked, "Who wants to go tubing?" Of course, no rafts or rivers were involved - "tubing" referred to eating hasma, a traditional Chinese dessert made from the fallopian tubes of frogs. The team member that didn't do the table tennis challenge had to do this one. 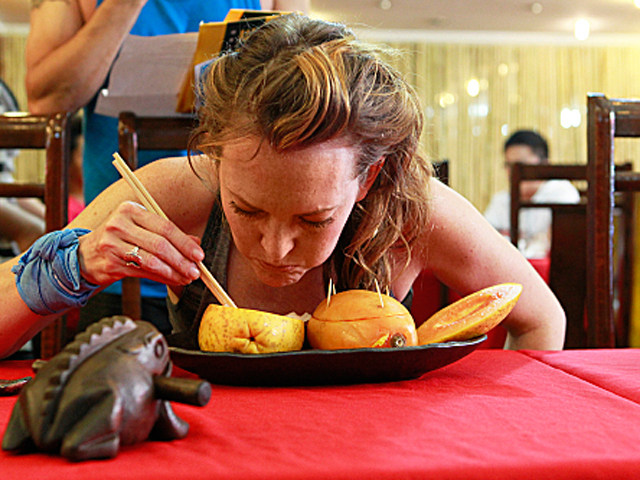 The clue also specified that competitors had to eat with chopsticks and could not use their hands or lift the hallowed-out papayas that held the food off the table. The monster truckers didn't read that part of the clue carefully enough, and after Dave finished the first batch he promptly was served a second, which he had to eat correctly. James and Abba finished the food challenge first, and the next clue told them to head to the Bund and look for a woman using an abacus. Apparently, some of the teams weren't sure what an abacus was (or how to pronounce it), and this made her very difficult to locate. Amy and Daniel were the first to find her and were given a clue that led to the pit stop, which was atop the Bund Observatory. But before they could head over there, BFFs Caitlin and Brittany and dating divorcees Abbie and Ryan crossed their path and asked where to find the woman with the abacus - and the couple obliged, giving them instructions down to the number of yards. This proved to be a disastrous move, because as a result Abbie and Ryan were able to beat them to the finish line and came in first place. That means if they win the last leg of the race, they'll win $2 million instead of the usual $1 million. When Amy and Daniel made it to the finish line - just moments after the divorcees - you could see they realized they made a huge mistake. Caitlin and Brittany arrived in third place, followed by twins Natalie and Nadiya, monster truckers Dave and Kelley, friends James and Abba, goat farmers Josh and Brent, friends/substitute teachers Gary and Will, dating couple Trey and Lexi, Chippendale friends James and Jaymes, and engaged couple Rob and Sheila, who came in last place and were promptly eliminated from the race. Tell us: What did you think of "The Amazing Race" premiere?